The Relyon Memory Pocket Sensation mattress is a highly comfortable mattress that combines the comfort and support of memory foam and pocket springs. This Relyon mattress is very popular thanks to this amazing combination and low price. In fact, the Relyon Memory Pocket is one of the cheapest memory foam mattresses. This Relyon mattress also benefits from a removable zipped Coolmax cover that can be easily cleaned to keep your mattress good as new. 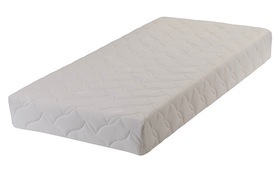 A generous 5 year warranty is offered with this mattress through Mattress Online. The 1050 pocket springs and 35mm layer of memory foam make this medium feel mattress a highly supportive model that offers great pressure relief. The innovative cover incorporated is hypoallergenic so perfect for asthma sufferers and there’s no need to regularly turn this 20cm thick mattress. Relyon Memory Pocket Sensation mattress are available from small single sizes to superking size starting at just £179.95. However note that the small single and small double mattresses cost the same as their regular sized equivalents.